Drive through any National Park in Africa and you will encounter it straight away: children along the road waving at you and asking for money or candy… Fun?! Sweet?! Not, in my opinion. This is one of many ways you encounter the dependency syndrome that Africa is struggling with. How can we change this? That’s something I would like to share my vision about with you. Are you really giving what you think you are? Stop with just giving! That should be the basic principle. A contradiction you might think, considering that I work for a charity. Charities exist on what every-one is willing to give them. And I don’t want to change that. What my aim is to look beyond just giving. 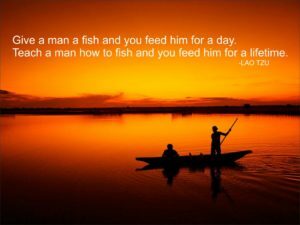 In my work I am inspired by the saying: “Give a man a fish, he can eat for a day. Teach him how to fish, he can eat for a life time.” If you give a child some candy along the road, it will wait for you again tomorrow. Are you driving by again? Most likely not. And if you do, you will find it annoying at some point that the child will keep asking you for candy. In the meantime someone else will come along and will give the child some candy. Before you know it, the child will be there every day waiting for candy. What does this child learn? If I wait long enough, I will get some candy. Of course candy is just something small. But this is where it starts and how something small becomes something big. This is unfortunately typical behaviour that you come across in Africa. Knowledge for Children works with a co-investment model in everything that we do in Africa. Working together for a better future with everyone taking on their own responsibility. Together with the school and their community we buy text books. With this we teach the school how to mobilise their community to raise funds for books for their children. In the 1st year parents pay 15% of the costs of the books. Throughout our 3 year program, we build up to an equal partnership where we both pay half of the costs of the books. It probably sounds like a great plan but this is not an easy task in a culture where people are used to getting things after waiting for it long enough. In our first year in Uganda, we were looking for schools to start working with. We came across a school that we explained our program to and head teacher responded; ”Why should we pay for the books? We can just as easily find another charity that will just give them for free.” And this is also what happened, the school found a charity providing them with the books they wanted. You might think: good for them! I think: what a pity for them. The books they got will eventually get spoiled and will need replacement. Then the school has to find another charity to help them out and who knows how long that will take. The waiting will be at the expense of the quality of education. Of course I am a bit bummed out when a schools reacts like this and also manages to organise it like that. It will obviously not stimulate other schools in the nearby area to join our program. But still, after the 3 years that I have worked in Uganda now, I experience a big change in mind-set. The past 2 years, schools are approaching us to join the program. They want to learn how to take matters into their own hands. And that is exactly what we aim for: take charge of your own destiny. Stop with the dependency syndrome! The books are a way of showing the school and their community how they are able to raise a considerable amount on their own. With this they work on a better future for the school and therefor for their children. In the mean-time we train the leaders of the school how they can plan for the future of their school. This way the school can continue working together with their community on projects that the school needs when they graduate from our program. Improving the quality of education in the schools is not possible without involving the teachers. We work together with the Primary Teachers Colleges (PTC) as they are not only responsible for educating the teachers of the future but also are responsible for the quality of education in the schools. Together with their tutors, we train the teachers how to use books and how to teach in a more interactive way. This is also part of our co-investment model. Ensuring that the responsibility stays where it is, at the PTC and work together in improving the quality of education together. This way all stakeholders in education at the schools are working together for a better future for their children. We train and guide them for a period of 3 years. We show them how to do more and more themselves and taking on a bigger responsibility over time. This so we eventually are redundant and the school can move on independently. 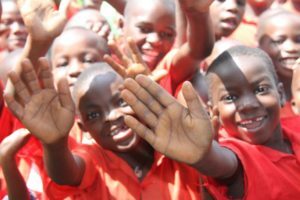 Proof that this approach works, will be shown next week during our Annual General Meeting in Uganda where we will celebrate the graduation of another 10 schools that have successfully completed our program! Our program is focussed on primary schools and at this point the 3 step model is steady as a rock. In my new role within our organisation, I aim at achieving self-reliance within our local organisations in Cameroon, Kenya and Uganda. In our vision, this starts with financial equality. This means that we are working to a future where half of the costs to cover all activities following our program are coming from the countries within. A big part of the local funding already comes from our co-investment model in the schools. The schools and their communities pay their contribution towards the books. When we buy their books, we receive a discount from the publishers supporting our program. But our co-investment model goes beyond because we also want the local government and companies to play their part. I work closely with our local Boards in order to enable this final step in our co-investment model. This again is a change in mind-set in every sense of the word. It demands time and perseverance but the first signs of local governments taking on their responsibility to invest in the schools in their districts through our program, are there. With this offering us the final part of the foundation of fully implementing our co-investment model. Of course I think the children along the road or in general are sweet… At the end of the day, all that we do is for them. Show them that today they are not getting candy but something way more tangible. Something valuable that will enable them to buy as much candy as they want on their own in the future! 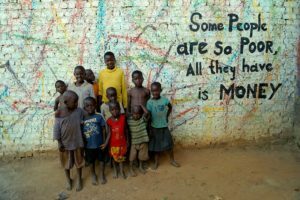 We cannot do the work we do in Africa without the support and donors. Have I convinced you to first think about what you are really giving? Do you share my vision and do you want to help me make Africa independent? Please contact me so we can discuss how you can support me!